The Kaiser Chiefs' debut album Employment was nowhere close to being one of my top albums of 2005, and yet it featured some unbelievably catchy singles. If not for the rest of the album (which was somewhat uneven) these guys could probably have ranked up there with The Futureheads and Bloc Party as one of my favourite British bands in recent years. As it is, the CD mainly just sits on my shelf and collects dust. However, I'm happy to say that the sophomore release from these guys may have me going back and taking another listen, because this thing is packed with more infectious melodies than you can shake a stick at. There's nothing that tops "I Predict A Riot" on here, but it's a lot more consistent overall. The Kaiser Chiefs sort of remind me of what I wish Supergrass still sounded like. Yours Truly, Angry Mob hits stores this Thursday. Information surrounding Dan Deacon is vague to say the least. We know that he is part of an art collective known as Wham City, he graduated from college after studying electro-acoustic and computer music composition, oh yeah and he's slightly weird. Everything else is up to debate (this included). His songs tend to favour electronic experimentation more than formal structure. Of these, "the Crystal Cat" is easily the most accessible song on his newest album, and it actually could end up being one of the sneak dance hits of the year. Mixing a bit of new-wave, future shock, and acoustic jams, Deacon has created some of the most interesting, and memorable music of the year. Slightly absurd, slightly chaotic, but always intriguing. If you remain skeptical, you just need to hear the 12-minute "Wham City" to believe. 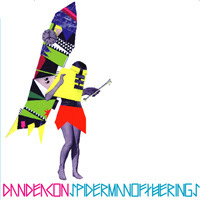 Check out Spiderman of the Rings soon on Psych-o-path Records. The other day I went on a small roadtrip, and as we all know, roadtrips are really just veiled opportunities to finally listen to all that music that's been sitting on your iPod. Roadtrips are also a great chance to distinguish 'okay' albums from true 'masterpieces.' On that note, I feel that Blonde Redhead's new album 23 is leaning towards the latter. Although I've never been a big fan of theirs, I really loved Misery is a Butterfly, and I'm finding this new album much more instantly pleasurable than their previous releases. "Publisher" may be the first song I've heard of theirs to truly get stuck in my head. With all the important albums being released so far this year, this may be the first album of the year that I've actually got into. 23 will be released April 10th on 4AD Records. In case you missed it, Explosions In The Sky played Late Night with Conan O'Brien a couple of days ago (Tues. Feb. 20th to exact). This is one of the few (if not the only) times I can remember seeing an instrumental band play on a late night talk show, and it's interesting because they had to shorten the song "Welcome, Ghosts" considerably. I have to give Conan credit, they have some pretty cutting edge bands on the show. Also worth checking out: Peter, Bjorn and John's live performance from last month. When a band comes up with 13 new tracks and releases them as an EP, you have to wonder if they're undercompensating for something. Does this mean there is only an EP's worth of decent material here? Are half of the tracks just 10 second interludes or "skits" (as is common in the hip-hop world)? In the case of Brooklyn-based outfit The Detachment Kit, however, a 13 song EP is exactly that... 45 minutes of solid post-punk spazz-rock with no strings attached. I'm a little surprised these guys aren't bigger than they are, what with the comparisons to bands like Les Savy Fav and Cursive, but their songs do sometimes take a few listens before they really hit home. After releasing some material on The Self-Starter Foundation and their last album on Frenchkiss Records, it now seems that they're back to the drawing board and putting this disc out independently. Either way, it's just as good if not better than their previous stuff, so don't miss out. You can hear more songs on their MySpace page. Wolf Parade, Swan Lake, and Sunset Rubdown are three of the hottest Canadian indie rock acts to come along in years, and they're all connected by the participation of one man: Spencer Krug. But while Krug's uniquely warped melodies and drunken rhythms have been making him something of a household name as of late (at least within the insulated world of the blogosphere), you need only look back to an earlier band to spot the influence. Of course I'm talking about the band Frog Eyes and the creative genius of frontman Carey Mercer. The similarities are unmistakable, but I have to say, this latest Frog Eyes LP (is it their 5th?) blows both Sunset Rubdown and Swan Lake out of the water. I suppose it's a matter of personal preference, really, but the madness just seems to click a little more often for me here. Either way, if you're a fan of any of the aforementioned bands, you simply can't go wrong. Tears of the Valedictorian hits stores on May 1st, but you can pre-order it from Absolutely Kosher and get the album a month early (along with a free t-shirt!). Last year it was The Lemonheads (aka Evan Dando) who surprised us with a solid comeback record, instilling a refreshing wave of early 90's nostalgia into the indie rock scene. Now this year J Mascis, Lou Barlow and Murph (the recently re-united original line-up of Dinosaur Jr.) are the ones bringing back fond memories of my high school days with their upcoming album Beyond. It does seem a little strange that they are finally starting to live up to their name (perhaps Dinosaur Sr. would be a bit more appropriate), but this album definitely delivers with its sharp and fuzzy guitar riffs, crashing percussion and Mascis' familiar slacker vocals. Even though I wasn't much more than a casual fan when I was younger, hearing this stuff just gives me goosebumps because it's almost like that era of "alternative rock" never really ended. I was hoping to post a couple of different songs, but alas it seems that every other blog except for the mighty Pitchfork is getting hounded by legal threats so I'm not even going to bother. These are the two songs that are freely available out there right now, but I'm sure you can find the whole album if you really wanted. Beyond hits stores on May 1st. Andy Dixon burst onto the music scene at the ripe age of twelve as one o' them young punks in d.b.s., before going on to form The Red Light Sting and starting his own label Ache Records. Following the dissolution of The Sting, he started occupying much of his time with an electronic solo project called Secret Mommy. Influenced primarily by cut and paste sound collage duo Matmos, Dixon captured noises around him and threw them into a digital blender to create concoctions of varying themes. His last release, The Wisdom EP, seemed like a tip of the hat to Matmos' A Chance To Cut Is A Chance To Cure, as it remixes sounds recorded during an operation to remove his wisdom teeth. Now he has unveiled his "crowning achievement", Plays: an electronic album created from recordings of live musical instruments, none of which were allowed to be plugged in or electrified in any way. In other words, "the most anti-electronic electronic album" possible. If you're a fan of glitchy electronic music, this should be right up your alley. I'm sure it will be too abstract for some, but I found it quite refreshing. Dixon has also just released his first rock album in a while, an experimental free-improv band called Winning. It sounds a bit like something Hella's Zach Hill might come up with in one of his many side projects. The album is called This Is An Ad For Cigarettes, and is available from Ache Records now. Check 'em both out! If the name doesn't sound familiar, perhaps the vocals will. 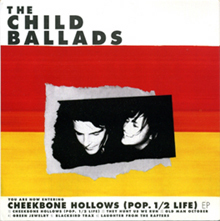 The Child Ballads is the main project of Stewart Lupton, once the lead singer of Johnathan Fire*Eater, a band which eventually went on to become the Walkmen - of course, without Lupton. While Johnathan Fire*Eater once appeared to be on the cutting edge of New York's indie rock scene, the Child Ballads appear to be heading in the exact opposite direction. That is, unless country music is making a comeback (which we all hope it is). Lupton has abandoned his ironic, detached, NY-style attitude and replaced it with an acoustic guitar and poetic lyrics reminiscent of early Bob Dylan. I think everyone's first reaction to Bright Eyes is to think he's too pretentious, too pious, too prolific - even for a rock star. Well, I can't really argue against those claims, and I'm not gonna say anything different, but he always seems to be able to defend himself with some amazing music. Again, he returns with a new album Cassadaga to be released on April 10th. But before we can hear those tracks, we are offered his new EP entitled Four Winds which features the first single from the album, as well as four unreleased tracks. If these are the unreleased tracks, the LP should be amazing. This first single has a very country feel to it (including obscure fire-and-brimstone religious references) much like his album I'm Wide Awake, It's Morning. However, it appears as if he is going for a much fuller band sound, further distancing himself from the four-track recordings that first gained him notoriety. The EP also includes a guest appearance by the equally prolific, but less pretentious M. Ward. Tokyo's Polysics may sound like they come from outer space, but it's nice to see that they still subscribe to the earthly demands of the Japanese work ethic. Every time I turn around it seems like they've released some new material that I didn't even know about. Granted, with the amount of songs they put out, they can't all be winners, and I wouldn't say that "Catch On Everywhere" is necessarily my favourite Polysics song to date. Still, only in Japan would a band decide to record a song with the vocals pitched up for the entire duration, a la Alvin and the Chipmunks. (It does make for a pretty cute music video though.) This song may or may not appear on the next Polysics album, which has no release date set as far as I can tell. I've also included their somewhat superior previous single "You-You-You", which was released back in October. Booji Boy High are a Hot Chip side project with a Devo reference in their name, so I'm sure you can understand why my ears perked up when I first heard about them. Booji Boy (pronounced "Boogie Boy", at least in the Devo world) was one of the crazy characters dreamed up by Mark Mothersbaugh to go with the fictional world of their band. According to Wikipedia, "the intent of the figure is to satirize infantile regression in Western culture". Well, duh! Booji Boy High just put out their debut 7" on DFA Records, and the music definitely resembles Hot Chip, but maybe with a little more "whimsy", if you will. Check out another track over at the DFA Records MySpace page.